What a crazy week this was having Halloween on a Monday this year! It sure was fun though with a 6-year old who was super into being JJ Watt and a baby Snow White, who loved her first wagon ride! 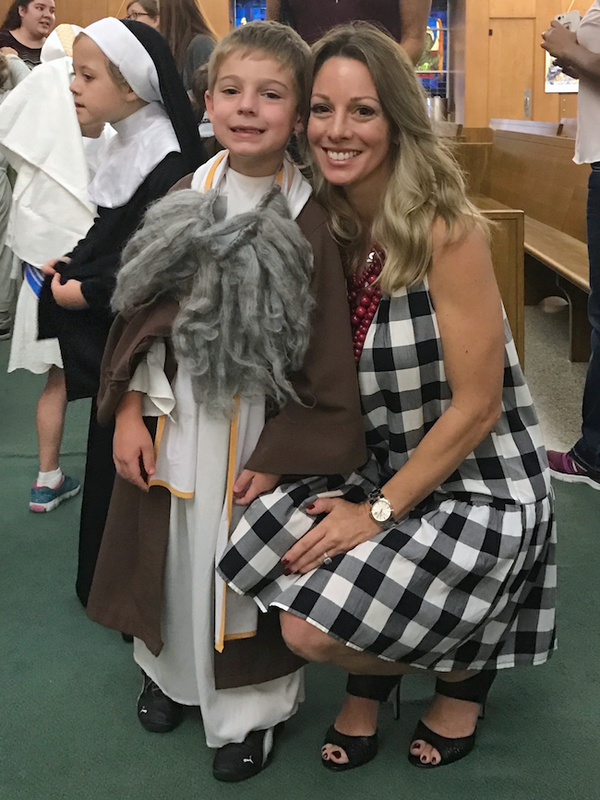 Then, the next day, James got to be St. James at church for All Saints Day. He took his role very seriously and we couldn’t have been more proud. And even though we’re looking forward to Thanksgiving now (just did the group text menu planning with the ladies in the fam), I’m super excited to reveal a Christmas project I’ve been working on for the last couple of weeks on Monday! Did you see the sneak peek on InstaStories? @Honeywerehome I hope you’ll come back Monday so I can share it with you! 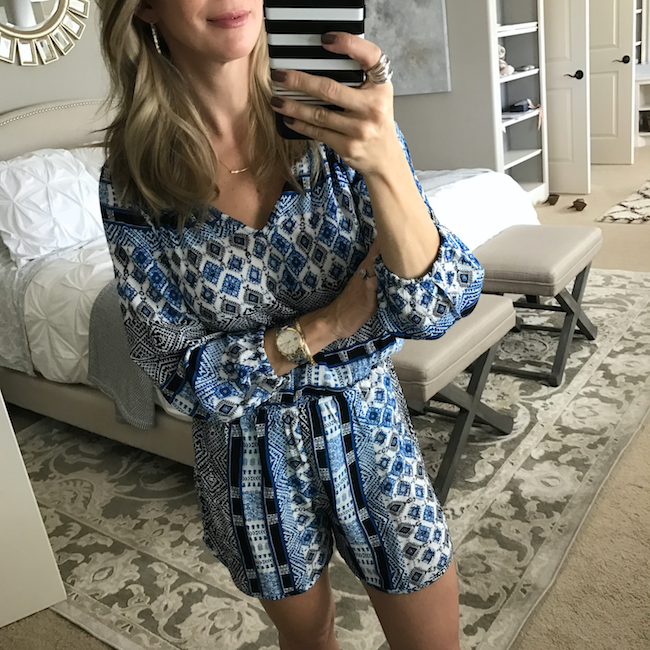 Today, I have another jam packed post full of all the outfits I’ve been wearing lately, hence the very creative title of this post. You can search ‘Outfits Lately‘ on the top right search bar of my blog to see all the posts in that category. That’s where I round up all the things I’ve been mixing and matching from my closet with some new things thrown in here and there. 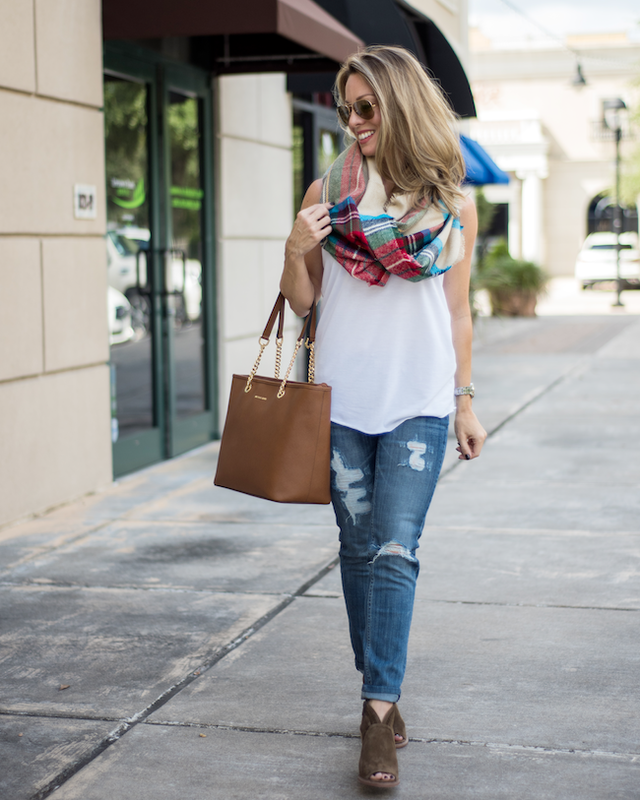 Peep Toe Booties – Hands down, this is my favorite Fall purchase so far. These peep-toe booties are so cute, with perforated detail and a chunky wooden heel. They are slightly padded for extra comfort and go with everything from jeans to dresses and even shorts. They come in 3 colors and I have the wood suede. They fit TTS and since you don’t wear socks with them, I go in the same size I buy for flip flops or heels as opposed to sizing up for boots I’d wear socks with. 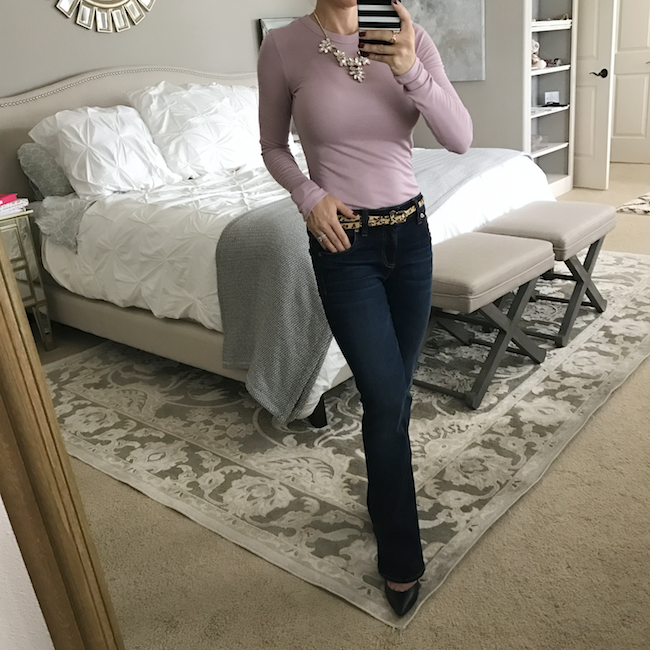 Bootcut Jeans (0P) – Need I say more than these jeans add 10 inches to your legs? 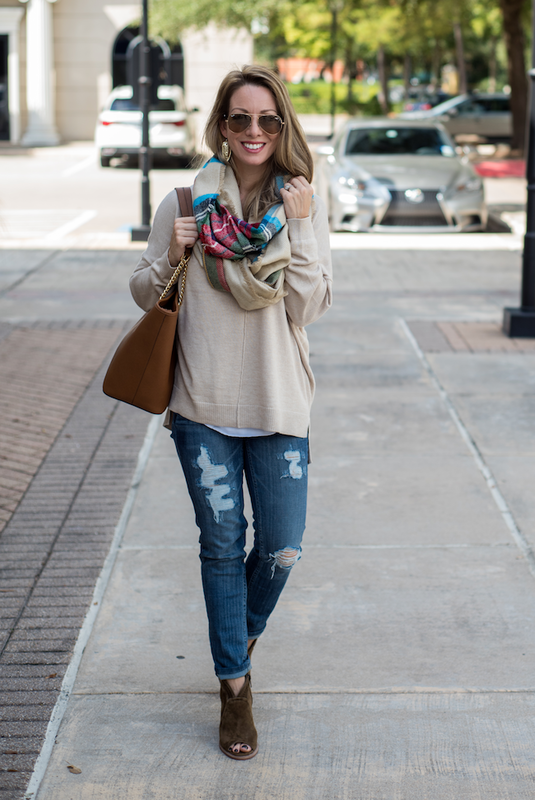 The darker solid wash is so flattering and they are only $89.50. They run on the big side, so you can size down. I wear 0P. Corduroy Skinny Pants 0P – Especially if you are looking for something you can probably wear to work or running around in that isn’t jeans, these skinny cords are perfect for you. They come in 10 colors (will go with all your sweaters and scarves!) and are only $69.50. I’m 0P in them also as they are by the same brand as the bootcut jeans above. Military Jacket – This military jacket by Hinge is awesome! It’s great quality, comes in three colors and is currently on sale 25% off! It’s normally $99, but now $69.99. Scoop it up before it sells out and size down because it runs big. Mine is XXS. 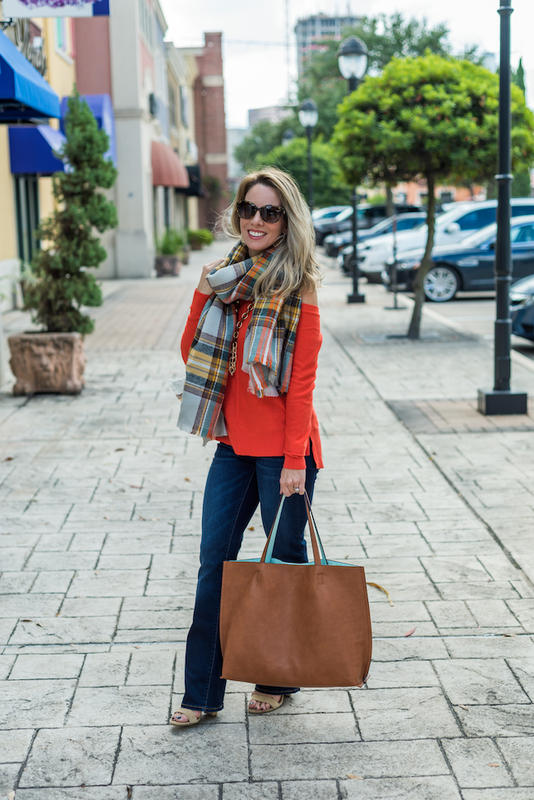 Plaid Infinity Scarf – This little infinity scarf has gorgeous colors in it that will brighten your outfit instantly. It’s a steal at $25. Leopard Clutch – Everyone needs a little leopard in their closet and this clutch is the perfect way to accomplish that. It’s not too big to be obtrusive and not too small to be impractical. It’s way less expensive than the other versions I’ve seen for $200+ at $79.95. Hoop Earrings – Gotta love a hoop and I like that this one dangles a bit, so it’s different from your typical hoop. 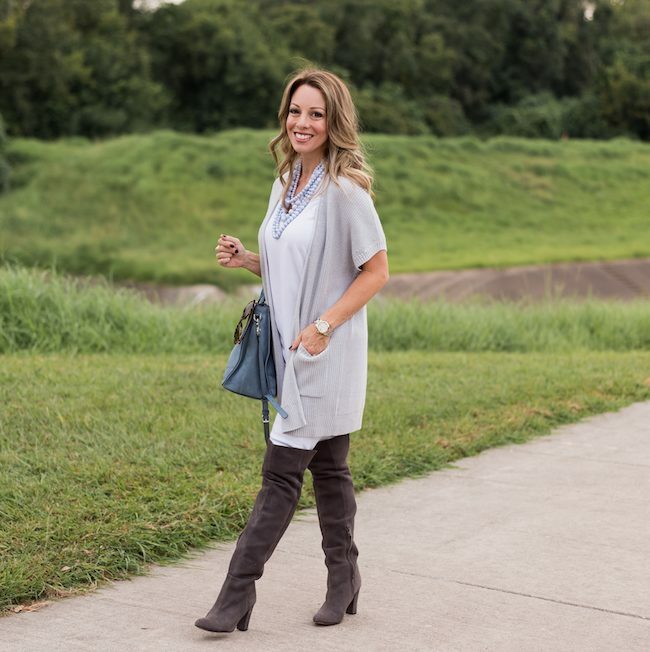 Brown OTK Boots & Grey OTK Boots – If you haven’t gotten a pair of hot, Over-the-Knee boots, do it! 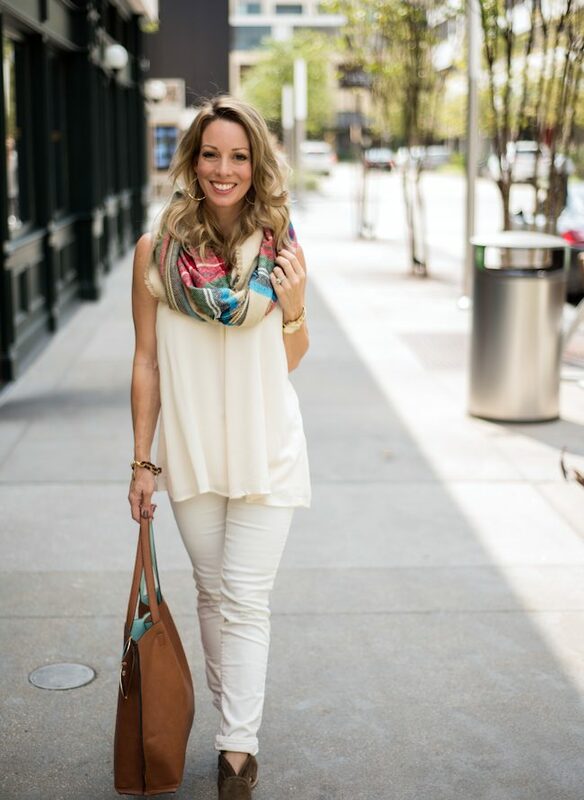 They amp up your outfit like nothing other and you’ll feel like superwoman in them! Both of these pair I own are comfy, you can bend your knee in them and they’re on sale. The grey pair are slimmer, so they’ll go better with skirts and dresses, but you can wear both of them with jeans and a sweater super easily. 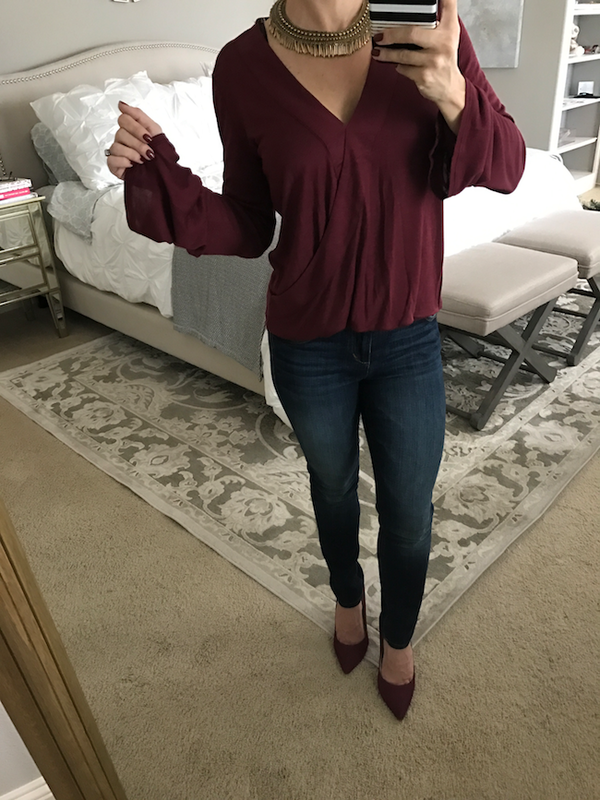 Now, onto the Outfits Lately and ways I’ve been wearing these pieces so you can get some ideas for yourself? Even though Houston is still behind on the cooler temps, it doesn’t stop of from dreaming and they’ll be here soon enough. 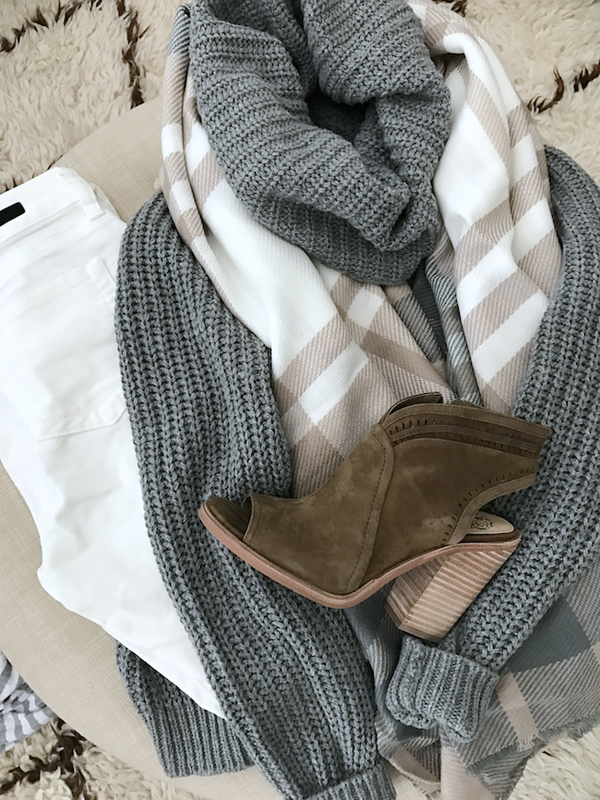 Till then, this cozy sweater outfit flat lay will have to do. Most of our days look more like this. It’s cool enough for jeans and booties and maybe a scarf, but tanks and tees are still appropriate most of the time. I told you these bootcut jeans have been in heavy rotation and I love how long and lean they make your legs look. 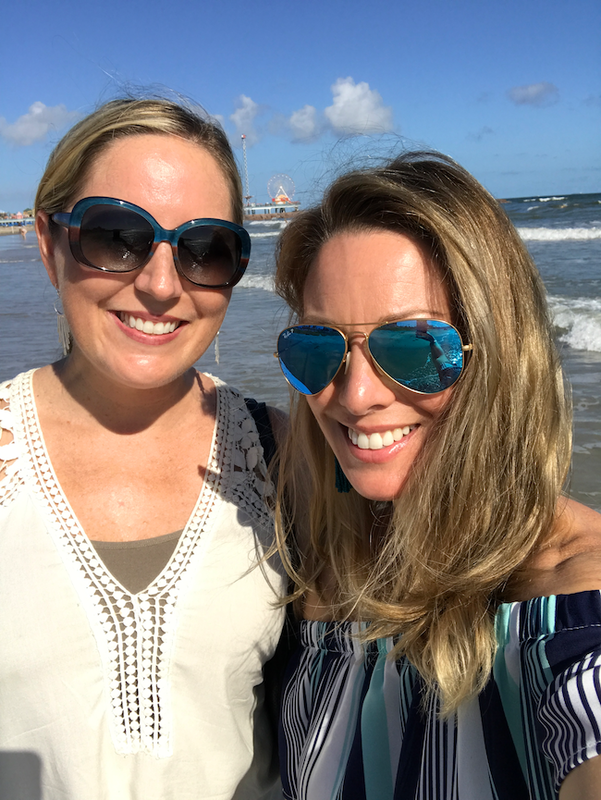 I got a chance to take a quick road trip to Galveston with my bestie recently. That half-day trip was good for the soul. Mental note: do that more often! 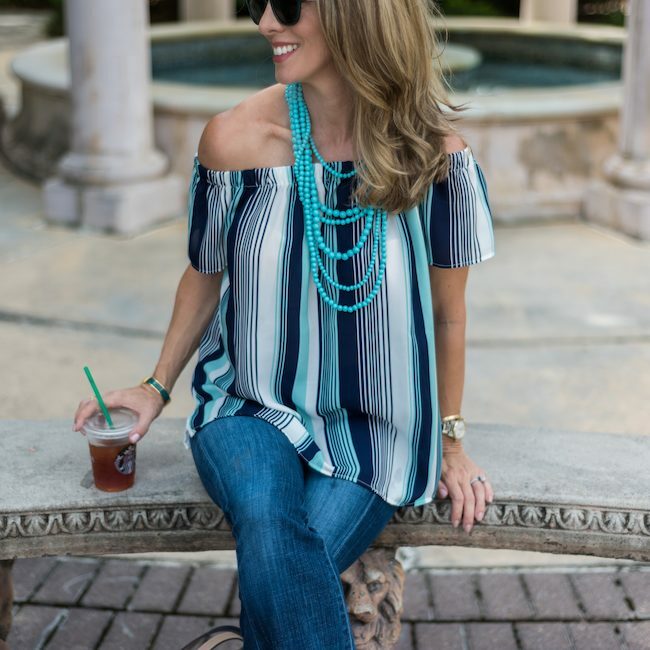 Off Shoulder Top XS 65% off, $16.80 | Aviators ($12 Version) | Strapless Bra | Tassel Earrings | Necklace Here’s a better look at that top I wore to the beach, it’s a steal right now! Romper XS 40% off | NecklaceHere are those bootcut jeans again. To maximize the leg-lengthening effect, it’s best to wear a slim, fitted top tucked in. I also found a great pair of lightweight corduroy pants that I’m in love with. 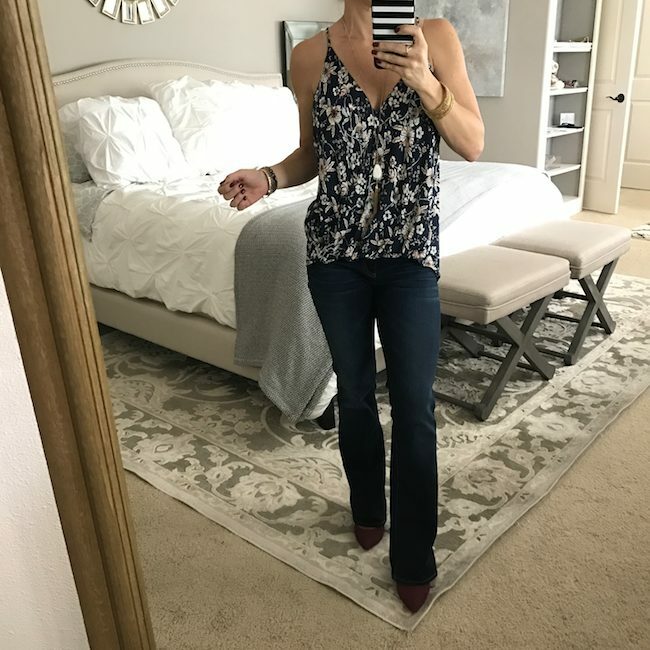 They are by the same company that makes the bootcut jeans and they come in lots of colors. It’s a bonus that they are very affordable. Below is a better look at the same outfit, minus the military jacket and with that colorful infinity scarf again. The tank is on major sale if they still have any sizes left! It comes in black too. The military jacket is a big wardrobe must have and I have a post coming soon with my Top 3 Jackets for Fall, so stay tuned! Here’s the same look without the jacket so you can see the sweater and bag better. And this is proof that us short women can wear over-the-knee boots too! When our weather gets colder, you better believe I’ll be wearing these all the time! I’m also smitten with my slimmer grey pair. If I had to choose just one color of OTK boots though, I’d pick brown because you can pair that with tan, black, grey very easily. Black can sometimes be too harsh for day, and grey is a close second. 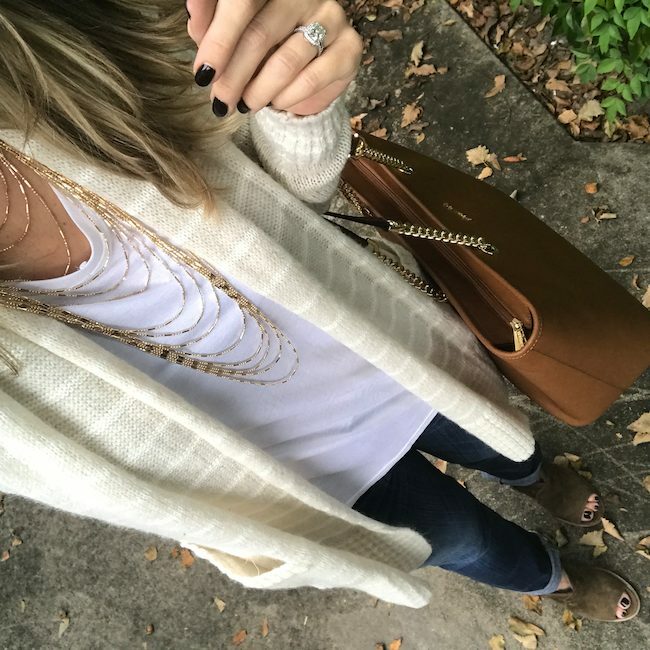 White Jeans 25 | Favorite White Tank $18 US4 | Similar Short Sleeve Cardi | Grey OTK Boots | Bag | NecklaceThis beaded necklace is so fun. Lots of colors to choose from to dress up your outfits. 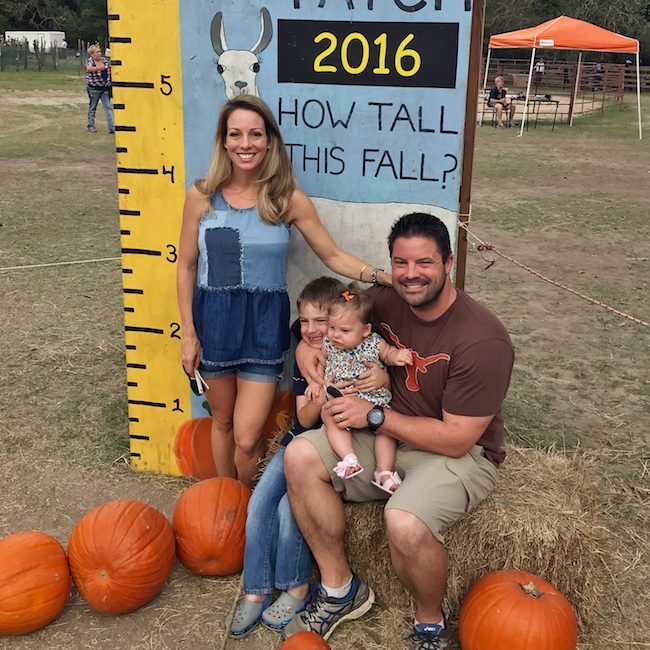 We took Jordan to her first pumpkin patch recently. I love getting to experience all these firsts with her. Pumpkin patch #2 with our extended family too. Did you dress up for Halloween this year? 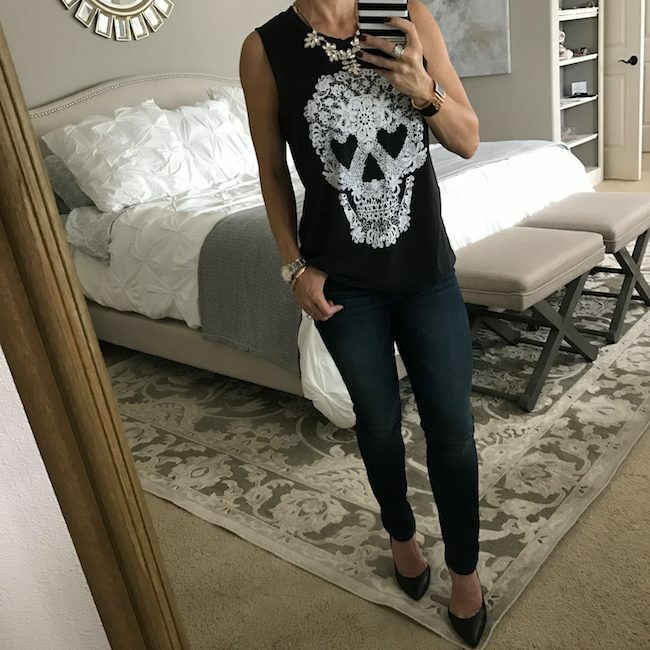 I didn’t don a costume, but this cheapie skull tank from Target was a hit. 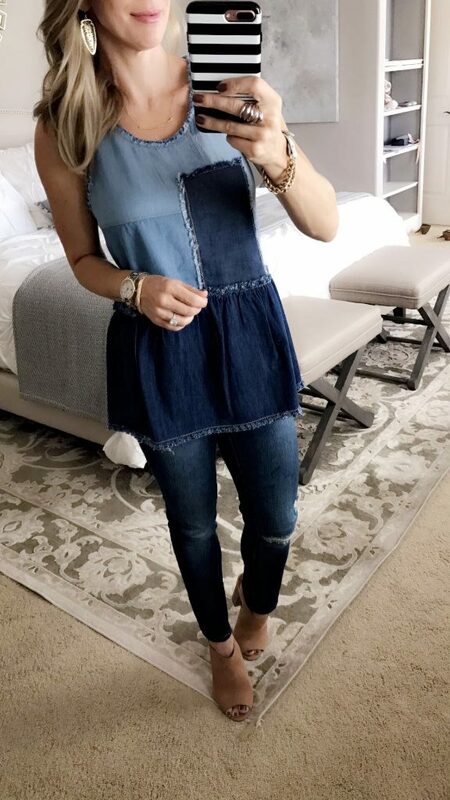 See, you can mix denim and denim! 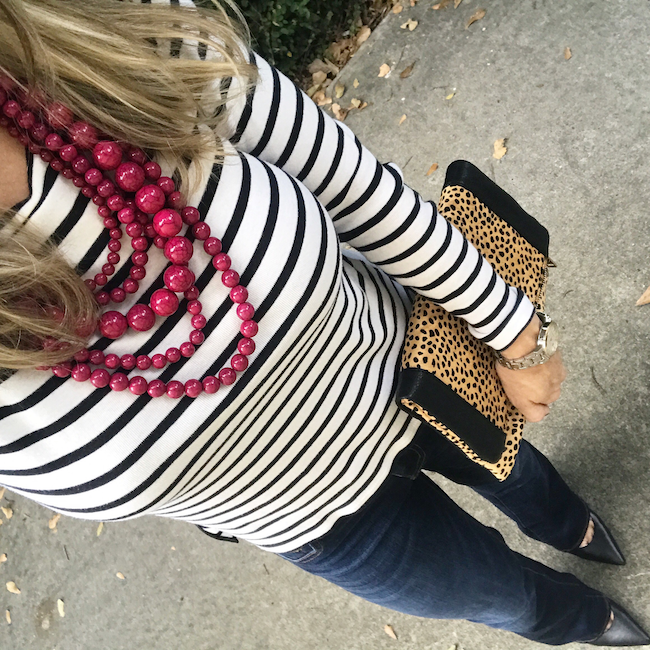 And always stripes and leopard! We did have a couple cool snaps that we got to take advantage of. 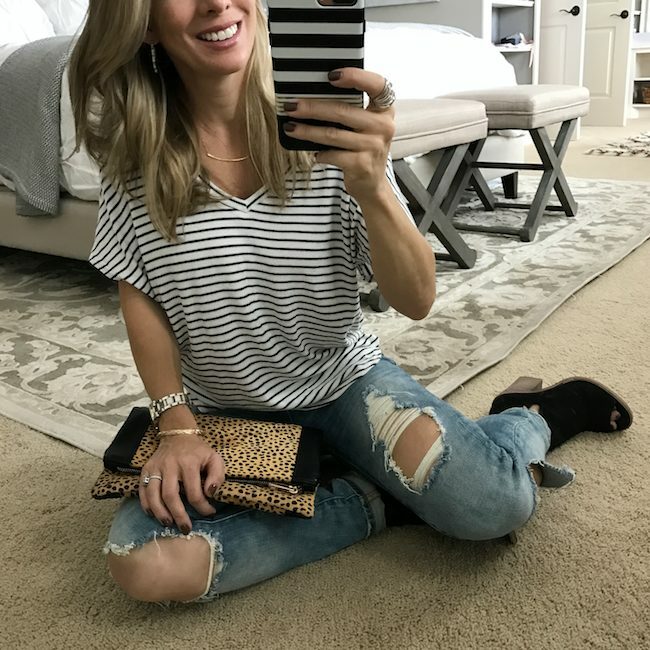 This striped cardi is on major sale in the grey/white version. 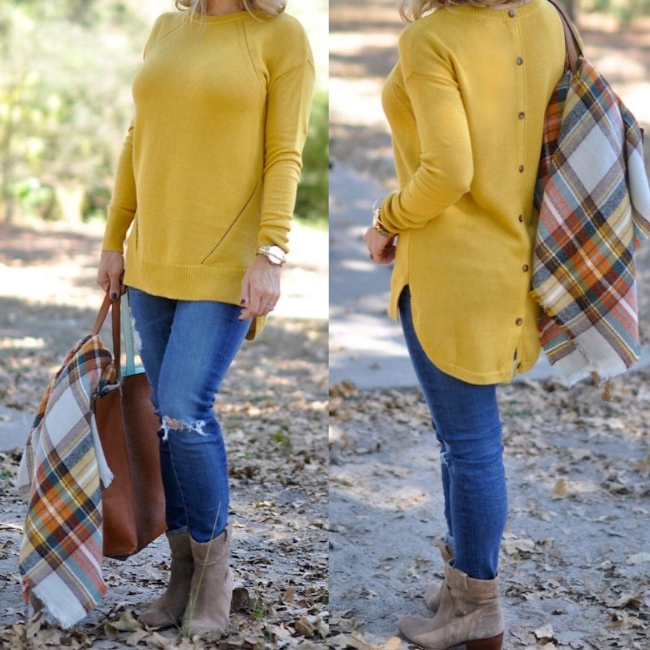 This button-back sweater is back in stock in 4 colors, I’m wearing XS. Neutrals are my safe place. But I also love this colorful cold-shoulder sweater. The grey/white stripe one is also pretty! 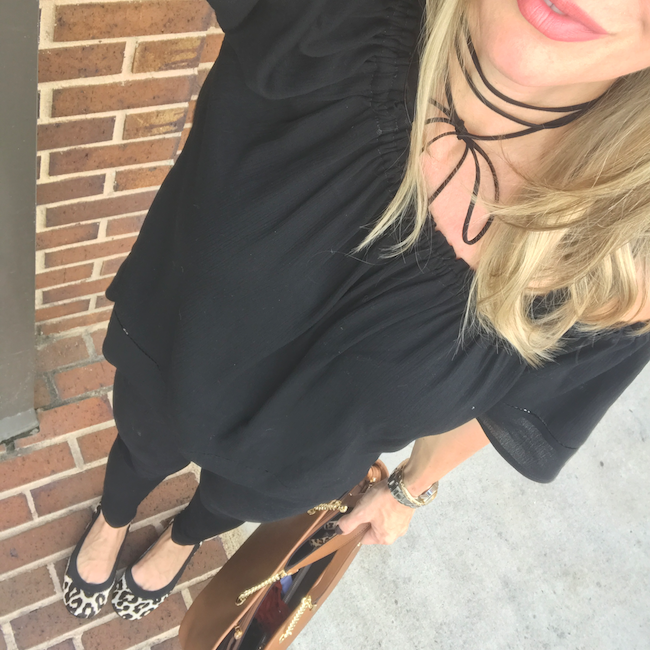 Did you know that Spanx makes faux-leather leggings?! #cometomama If you like leggings, but feel like you need Spanx with them, this is your answer, and they come in black camo, leopard and regular solid colors too. If you’re already in need of warm boots, UGG’s little sister brand, Koolaburra has several styles under $100. Can’t beat that! I’m hooked on the choker trend. 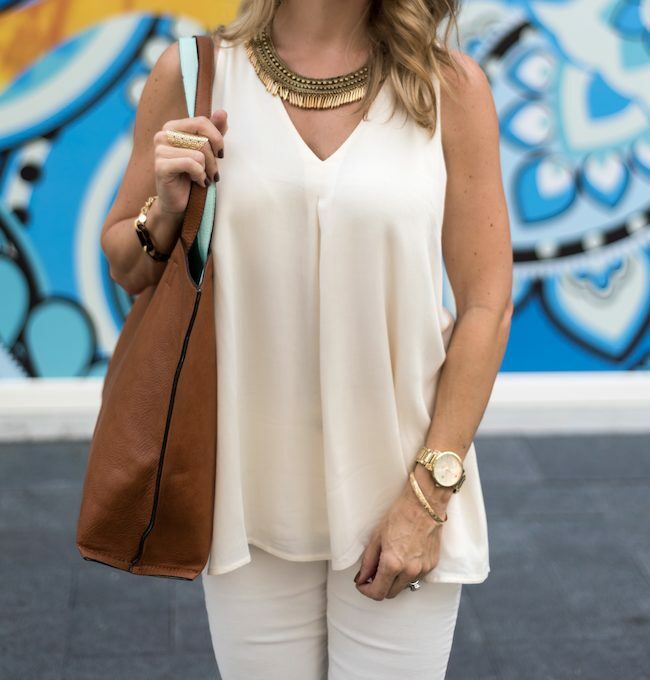 They add a cool vibe to your outfit and you can find so many inexpensive styles. We had a date night at North Italia last weekend, so yummy! If you live in Houston, you must go try their artichoke appetizer and spaghetti and meatballs. 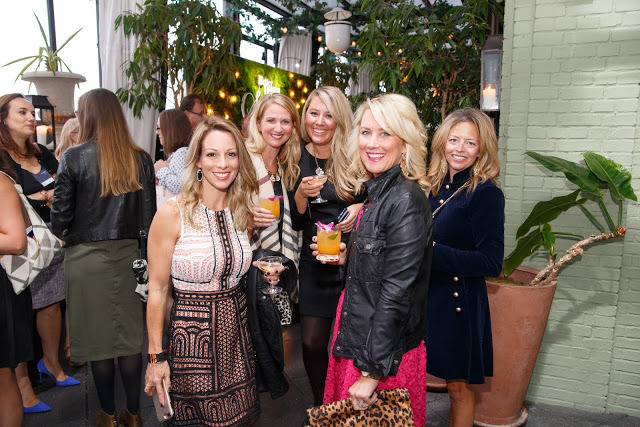 I won’t soon forget the awesome time we had in NYC last month for the BH&G Stylemaker event. After many outfits were tried on, discussed and decided on, it was this lace overlay dress that I wore to the cocktail party. 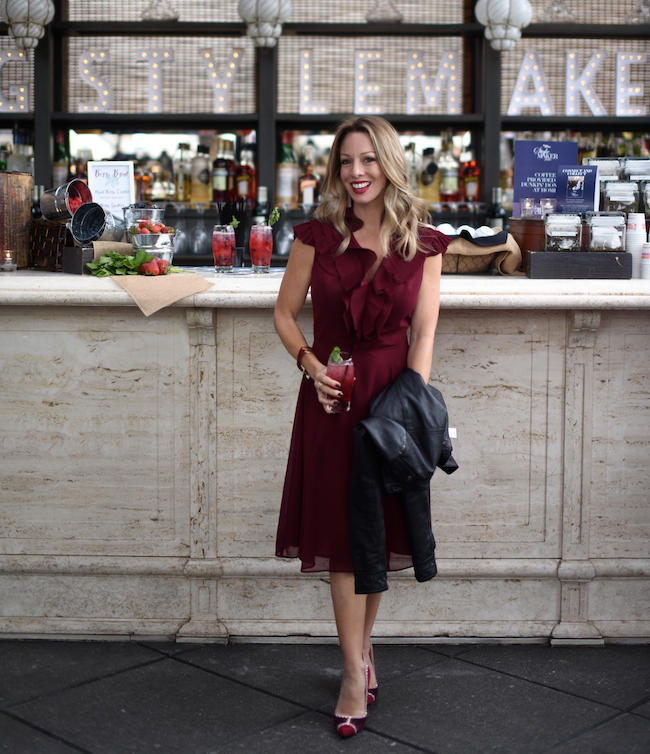 And this stunning burgundy dress that I wore to the actual event. Thank YOU so much for helping me decide! You can see a recap of the event here. 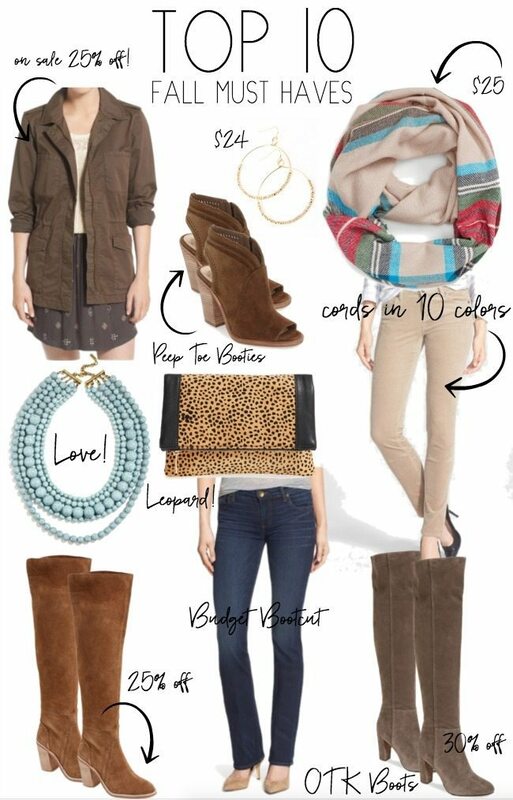 What’s on your Top 10 Fall Must-Have List? P.S. Nordstrom’s Fall Clearance Sale is going on now, save up to 40%! So. Much. Goodness. I love it all! And you look absolutely fabulous in everything!